God makes my soul prosper by providing me with rest and relaxation–something I had never even considered a need, let alone a need that God wants to meet. Recently, I have been having unusual fantasies. Normally, my fantasies are about finishing our house, getting a better job, my husband having more time off, me fitting into my skinny jeans—that sort of thing. But, all last week, I kept thinking about having twelve hours of uninterrupted sleep, having a day or even several hours to do whatever I wanted, alone. It’s odd how when you’re a child, you might get those two full days of freedom—the weekend, but as soon as your adult, it just doesn’t happen. The weekends get crammed full with run-off from the work week—laundry, house cleaning, grocery shopping, bill-paying, gift shopping, errands, and the unending necessity of cooking and doing dishes. Sigh. Before I started teaching, I took a day of annual leave on occasion, simply to have eight hours of time to myself. As a teacher, I can’t just take a day off whenever (or ever), and I feel the stress of not getting that time. Part of it is my fault. I am not sure what happened, when it happened, or how it happened, but I have trouble letting myself relax. Deeply ingrained in my make-up is the rule be productive. I feel like I have to knock out the “to do” list. I must make progress. I must be constructive. Well, this can only go on so long, and then I SNAP. Usually, my snaps are not that dramatic. I eat too many cookies, cry a little, a sleep it off. To avoid those kinds of meltdowns, and also simply to remember who I am and what it’s like to have fun, I am trying to have an unproductive day of whatever here and there, or at least a few hours. I did it today, and I want to do it again! I can’t imagine the bliss of having a real day off every week. Today, I just limited the items on my “to do” list to very simple tasks that would be easy to achieve. Then, I moved the excess items to next week. Ahhh…a day off. It was so nice to get up without being in a rush to get somewhere or do something. The morning had a completely different feel. I took a bubble bath, and used my fancy Bath and Body Works sugar scrub, and drank my coffee in the tub. Then, I went to a local craft fair with my husband’s mother and aunt. I bought my niece’s birthday present, and the ingredients to make my step dad’s birthday cake. I mailed a package. There endeth my productivity. I indulged in a banana split for lunch because I’d been craving ice cream. Then, this afternoon, I lounged on the couch with my dog, and watched not one, but two chick flicks—Nanny Diaries and Post-Grad. I snuggled under a hand-crocheted afghan, breathed in warm, puppy smell (I know it’s strange, but I like it), and felt luxuriously well cared for. Still, I was going to have to get myself together at some point and fix supper for my husband…Then, my cell phone rang. It was hubby asking if I wanted to cook or if I wanted him to pick up something on his way home. Ha-ha! I did not have to cook or do dishes. I believe that this was a blessing, a treat, a God-given day! I have never really thought of my desire for time alone to relax as a need, but I think God does. I am seeing more and more that God sees me and my needs holistically. His care for me does not begin and end with food and clothing. What a gift this day has been. My needs have been abundantly met, by God. I wonder if it would be possible have time off like this on a regular basis. Definitely something worth praying about. Power Thought #8: God meets all my needs abundantly. It’s time for a new power thought! Let’s welcom Power Thought 8: God meets all my needs abundantly. This one may sound a little too familiar at first. Lots of people memorize the scripture, “My God will provide all my needs according to his riches in glory” (Philippians 4:19). It’s even in a lot of Christian praise songs. So, what’s new here? For me, it’s the holistic concept of prosperity. I have always in the past thought of prosperity and God meeting my needs only in terms of finances. God will provide money to pay the bills, buy food, and provide shelter. Yet, God sees our prosperity and meeting our needs as something that encompasses a lot more. We do, after all, have other needs, right? Isn’t part of being prosperous having good health, loving relationships, lots of friends, rewarding work, creative outlets, relaxation, and the ability and means to bless others?! It is exciting to meditate on all the fullness of the prosperity God wants to give us in meeting all of our needs. I also had the realization as I was reading about this power thought, that I need to have an attitude of expectation for abundance and blessing in all areas of my life. God meets my needs constantly by giving me wisdom, helping me to solve a difficult problem, supplying a word of encouragement when I need it–the list goes on and on. The chapter for each power thought has several “think about it” questions. One of the questions that really got me was this: “What are you expecting?” I had to be honest–not much. I expect God to help me with the tasks and demands of the day. The end. Another way of looking at that is to say that I expected God to give me the help I needed to survive the day. Now, I am realizing that God wants more for me that simply “surviving the day.” It is time for me to reexamine and lift up my expectations so that I can really embrace the thought: God meets all my needs abundantly. Now, time to meditate on that and renew my mind! Now that I have been working with the Power Thought I am content and emotionally stable for a few days, I can say it out loud without giggling. It’s not the content part that gets me–I think it’s the idea in my mind that only a person who is not emotionally stable would have the need affirm that they in fact are emotionally stable by saying it out loud. Of course, like most people I imagine, I don’t see myself as emotionally unstable, but I do see that I am easily thrown, and then once thrown, I dwell on it. What kinds of things throw me off? These aren’t big things, I realize, but apparently, I do not handle surprise very well, and I am easily and often surprised. Then, I focus on it–why was I surprised? What does this mean about me? Why didn’t I anticipate this event/news/change in plans? How should I have handled it? What should I do now? In realizing this “easily shocked” factor about my personality or way of being, I now see that an important part of being emotionally stable is the ability to be undisturbed (unsurprised), unruffled by anything. So, that is one thing I see I need to work on to gain greater emotional stability. Just think about God, our Rock–can you imagine how disconcerting it would be to go to a God who is shocked and surprised much of the time? I want to have the character of Christ. I want to be steady. I want to be someone who is not easily thrown. Like many people, I developed a habit when I was younger of gauging myself–my status, my outfit, my career success, my place in life, based on what other people were doing. This is so worldly! God has a different agenda and a different curriculum, different plans, and different work he is doing in each of us. We are each so unique, that when you try to compare people, it is always like trying to compare apples and oranges. People just are not comparable. Plus, to compare is to despair. Focusing on what others have instead of being grateful for what I have, is a quick path to discontent. Similarly, if I become to focused on “someday” I fall into discontent. Someday, I will have such and such job. Someday, I will love exercise. Someday, the house will be finished The “someday” is elusive at best. It pulls my focus away from today’s blessings and causes me to contemplate what I still lack. I cannot learn to be content and emotionally stable in the future. I have to learn how to do it in the here and now. Finally, this may not be a “super spiritual” truth, but the fact is that I am given to discontent, depression, and despair when I overwork. In order to be content, I need time. It doesn’t have to be a lot of time, but I must discipline myself to take breaks, enjoy downtime that isn’t “productive” in order be refreshed and have a clear mind with which to give thanks and meditate on my blessings. The other evening, I was trying to get caught up on work. It was a Saturday night. It was after 7 p.m. and I had been gone all day. I felt the Lord telling me to take a break. I even sensed that I was supposed to do at least five things just for me, before I did any work. I took a hot bath. Then, I painted my toenails. Next, I read a little bit of a new book. I don’t remember the other things, but before I reached #5, I felt renewed. I realized how much I had needed a break, and I felt immensely grateful for it, as well as the other blessings in my life. No more work was accomplished that night, but that’s really not the point. I am content and emotionally stable. No giggling. I am ready for Power Thought 7: I am content and emotionally stable. Tha means I am also half way through the program. At this point, I think to tweak my methods a little. I spend a lot of time every week making an abundance of signs with my Crayola markers and the posting the new power thought all over the place. I don’t really see the signs that much, except for the one that is posted on the fridge, but it’s gotten to be a habit. The one thing that I really want to do more of and haven’t since the first week, is to take time and meditate and write about the week’s power thought and how I can apply it to my life. This week’s power thought is: I am content and emotionally stable. Joyce Meyer’s shares some practical ways to make this thought a part of your life in her book Power Thoughts and the chapter devoted to this particular idea. One good thing to do is to keep a list of all of your blessings–a long list of everything you are thankful for. I have started a list, and I hope to reread it and add to it through the week. I also can practice the power of “thank you”–that means being thankful in all circumstances, and focusing on the blessings, and what is going right instead of what is going wrong. This kind of thinking creates contentment and stability. I am also thinking about specific areas in my life where I tend to get discontent and instable–for me this happens mainly internally. I get impatient or frustrated with myself. I am not content with my progress. I get down on myself or upset about situations in my life. I want to be more secure and I want to treat myself kindly, and remain calm in all circumstances! Yes, those are very big goals. I am going to begin to work toward them this week, and I will get there. So, no big markered poster board signs this week; instead I have renewed my committment. I will renew my mind. I will renew my mind this week with Power Thought 7 in particular: I am content and emotinally stable. No Worrying! Trust God & Be Happy! Last week’s power thought was this: I love people and I enjoy helping them. While other power thoughts may help me in overcoming my negative thinking, this one was definitely the most fun so far. I am trying to put more thought into being a blessing, and I have already learned that when I really set my mind to the idea, I get all kinds of creative inspiration for ways to bless people. I plan to continue asking God each morning for someone to bless, and what to do for that person. It’s fun! 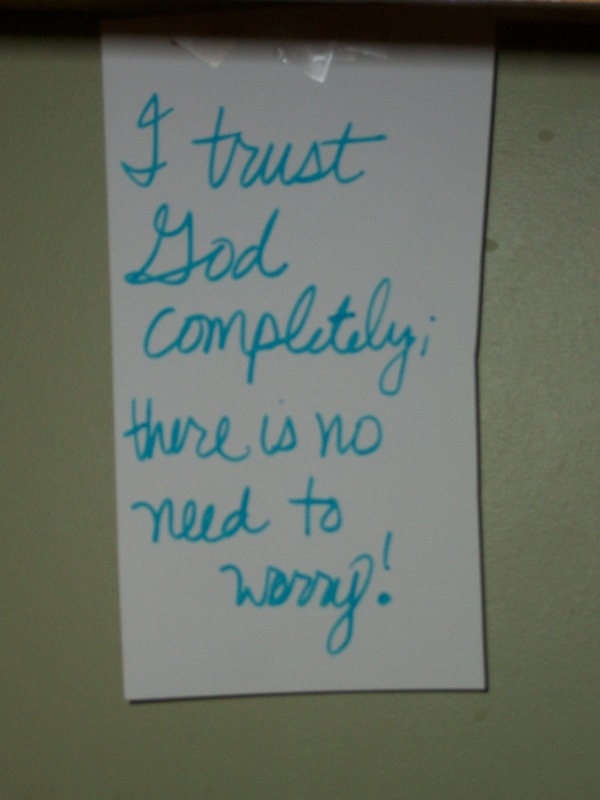 Now, it is time to move on to power thought #6: I trust God completely; there is no need to worry. This one is huge for me. I chose “trusting God” as my “word(s) of the year” because I felt that the single thing that robbed my joy most was worry. 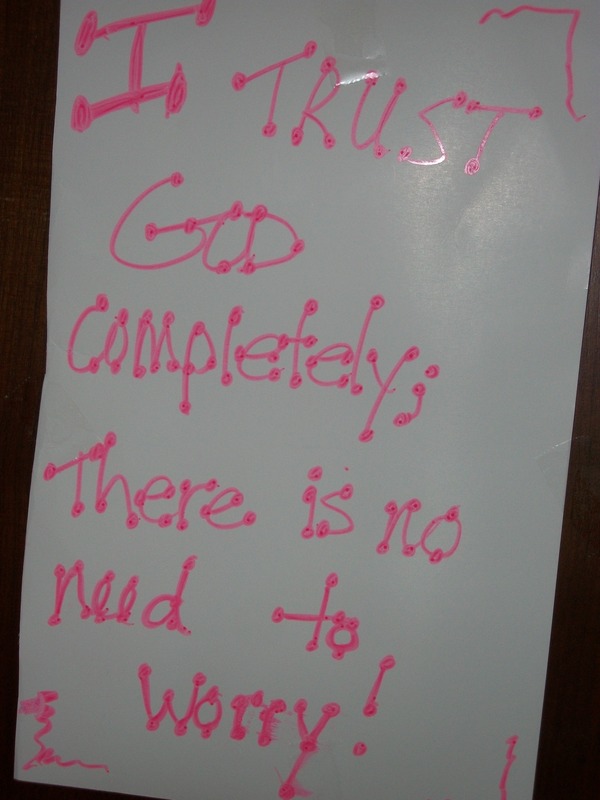 I realized that trusting God is the opposite of worry, so that is why it is my theme for 2011. I am excited to have the opportunity, and the inspiration from the book, to put all of my focus on trusting God instead of worrying. This has been a challenging week for those with a tendency to worry (me). We had a blizzard, new heifers calving during the blizzard, impassable roads, and lots of work/classes missed. In fact today is my fourth snow day/full day in the house. I had to cancel my classes again today because I simply cannot get out. Our roads have not been plowed. Clearly, there is nothing in my power to change the situation, and yet, there is still a temptation to worry about my classes, my job, missing school, falling behind, etc. Instead, I keep reminding myself that I have done everything I can do. This one is beyond my control. I just keep saying over and over again, “Lord, I trust you with ____________,” according to the specific situation. This practice is restoring my peace of mind, and enabling me to enjoy the day that I have, at home in the house. 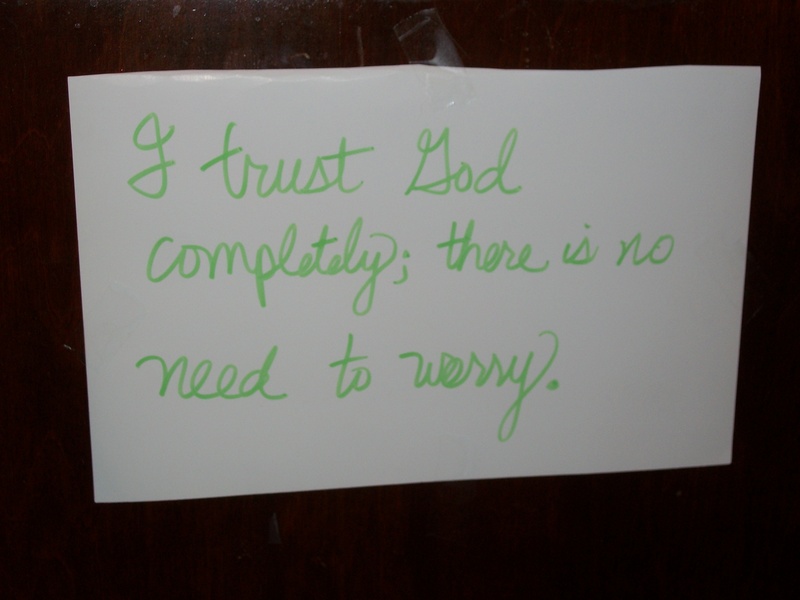 This week, let’s all practice saying and thinking: I trust God completely; there is no need to worry.